Yes, I’m starting the week with a kale salad. And yes, I realize that the internet is flooded with about 1 million kale recipes lately and we’re all a little over it. Or maybe that’s just me. It’s just that…well, I have finally, FINALLY come fully embraced kale and I want to tell you about it. My love (although full of qualifiers) of kale is growing exponentially as I begin to really understand what it’s all about. To appreciate it for what it is (a tough, leafy vitiman packed green) and not expect it to be something it’s not (lettuce). 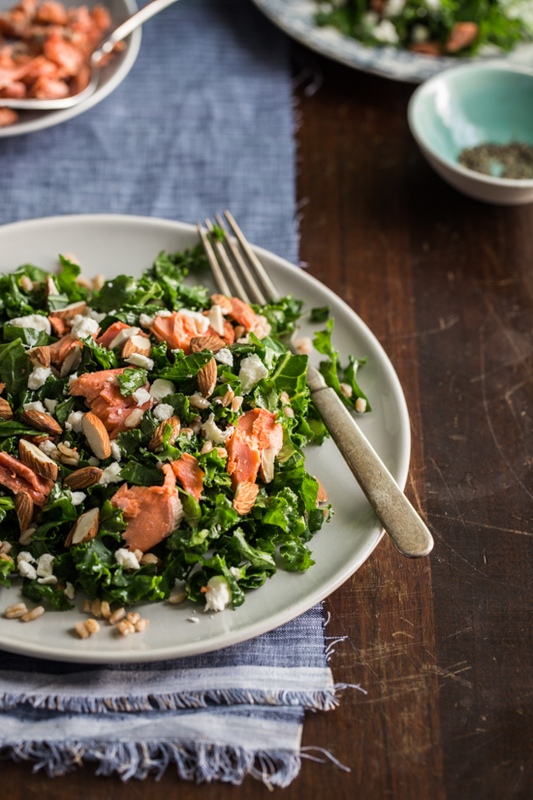 Enter: Kale Salad with Roasted Salmon. I can’t take full credit for this salad. I was inspired to make a copycat version of the amazing lunch that Helene, Tami and Mindi served us at the Food Styling and Photography Workshop in Birmingham last month. It was a salad that was so delicate, flavorful and delightful to eat that I could hardly believe that I was eating kale. I mean, kale is typically this tough, leathery green that is a beast to cook with, despite all of it’s health benefits. My previous successes with kale, like the Veggie Enchiladas and my not-so-guilty-pleasure kale chips, were always peppered in between epic fails like ‘Bitter Beyond Belief Sautéed Kale’ or ‘My Jaw is Dislocated From Trying to Chew this Raw Kale Salad’. I felt like I couldn’t get a real firm grasp of how to consistently handle kale. Well, after scarfing down an enormous plate of kale salad at the workshop, I knew I needed to once again go back to the drawing board. As I ate, I was mentally taking notes: First, the leaves were cut incredibly small, so much so that they resembled small parsley leaves. The next thing I noted was the color. 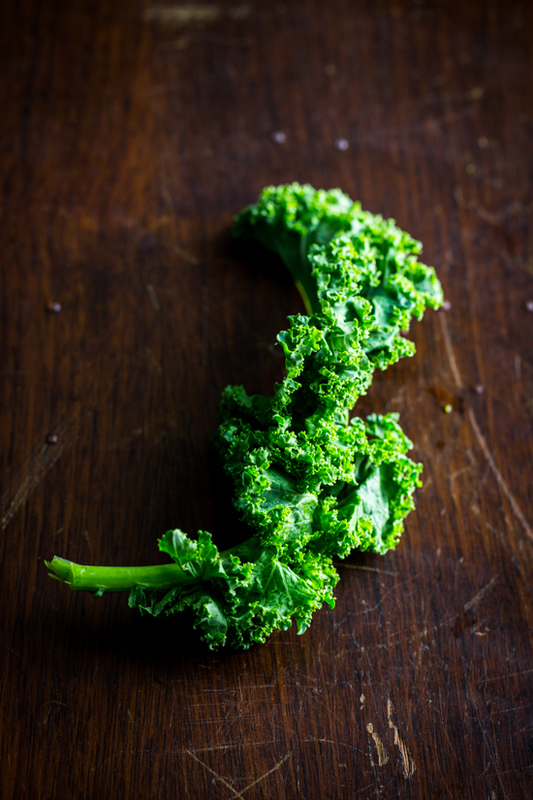 It was an incredible, vibrant green – not the dark color of typical raw kale. The dressing was light and lemony and a myriad of textures were provided by the feta, salmon, faro and pumpkin seeds. It was a joy to eat and I couldn’t really stop. I knew it was a must make once I returned home. I made very few changes in my version; although, in reality the entire thing is probably different from what the ladies served as I was going by my own (sometimes faulty) memory. I swapped toasted almonds for the pumpkin seeds for no reason other than that was what I had on hand. The almonds were perfect. I found that the secret to the tender kale leaves is allowing the kale to sit in the dressing, for about 30 minutes. Typically, dressing your salad early is a big no-no, but kale is a different animal…er, vegetable. It’s thick and tough, and needs the time in the acidic dressing to tenderize and become all delicious-like. After a while in the lemon vinaigrette, the kale is tender and beautiful bright green. Perfect. Also, be sure to cut the kale small. I’m talking chiffonade small. It makes a huge difference in your eating experience. Trust me. For this salad, I also recommend the curly version of kale. I received mine from our fabulous CSA, and it worked beautifully. I later bought the ‘dinosaur’ kale with the flatter leaves, just to see how it would turn out using the same technique, and I wasn’t as happy with it. For some reason, it remained more tough and bitter than the curly version. Perhaps I had a bad bunch, but either way, I would repeat this with the curly kale any day. This was definitely a salad to remember. Roast Salmon: Preheat oven to 475 degrees and season salmon filet with salt and pepper. Place butter on rimmed baking sheet and place in the oven until butter is melted. Remove sheet from oven and place salmon, skin down, onto melted butter. 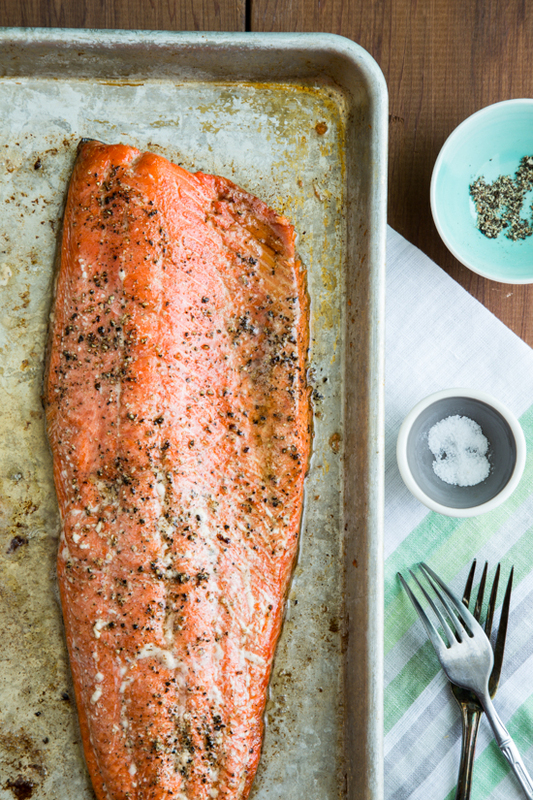 Roast salmon for 12 minutes or until just opaque. 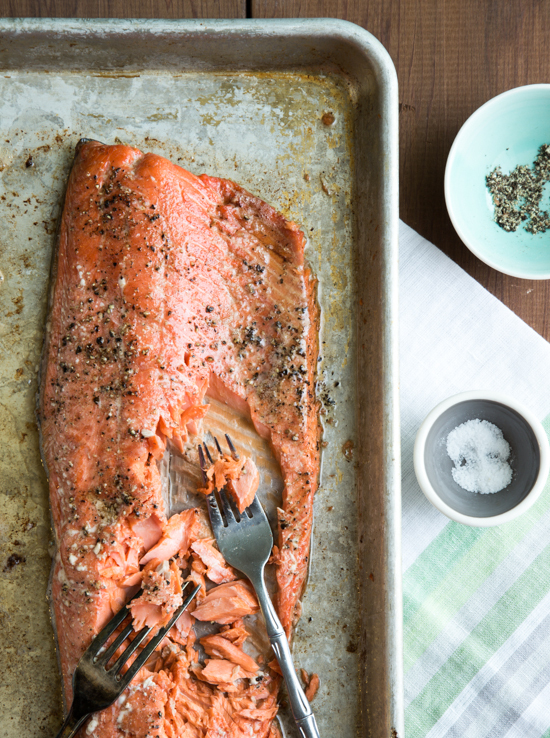 Allow salmon to cool before flaking salmon apart with a fork. Prepare Salad: While salmon is roasting, whisk together lemon juice and olive oil. Season with salt and pepper. In a large bowl, place kale and drizzle with lemon vinaigrette. Toss to combine and allow kale to sit at room temperature for about 30 minutes. Toss faro, feta, almonds and salmon into salad and serve. If making salad ahead of time, reserve feta, salmon and almonds until just before serving. I’ll admit that I’m not much of a salmon or kale person, but you make it look SO GOOD!! Thanks so much!! And I’m with you on the salmon, too. Not typically my fave, but the combination of the salmon and all of the other flavors worked really well together. I am so not over it yet! I just discovered kale and I love it! This is a great recipe using it! Yay! I’m so glad, Nancy 🙂 I feel like people are going to get sick of seeing kale recipes (because frankly, I feel that way a lot of the time) but every once in a while a different one creeps up that I just need to try. Have a great week!! I made this last week, and it was delicious!!! Then I made it this week again but this time I combined it with a couscous tabouli. Delicious!!! oohh! I love tabouli!! I have never had a couscous version, so I need to try that out. I’m so glad you loved the salad! 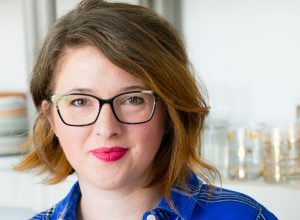 It has really gone a long way broadening my kale horizons 😉 Thanks so much for stopping by and taking the time to comment! Saw this on pinterest, made it tonight with some quinoa and LOVED it, really great combo of flavors. Thank you ma’am! Oh man, made this last night – could eat it every day. I did make a couple tweaks based on what was on hand: a) wheat berries instead of farro, b) no feta, but I added dried cranberries (great counterpoint to the salty, savory components) and c) tossed in a handful of hemp seeds (because why not?). I found I did not need all the dressing. Simple, light and amped with flavor (plus, separated, kept well for lunch the next day), I’ll definitely throw this together again! Thanks! yes to all of this! So glad you tried it and made it your own. Now I need to try this with the cranberries…Thanks for the inspiration!